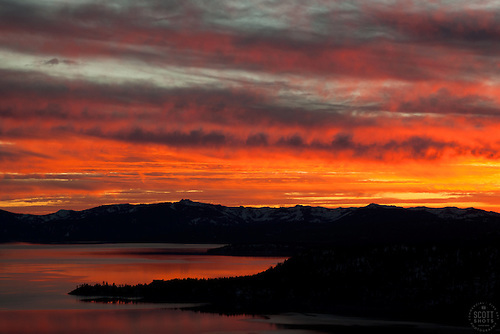 Last night I shot a fiery sunset out at Lake Tahoe. I went to a spot that I feel is one of the best and easiest places to get a good photo of Lake Tahoe, the popular vista point on HWY 431 or Mount Rose Highway. This spot provides a spectacular view for taking photos just steps from your car. From HWY 28 in Incline Village at the lake, take HWY 431 toward Reno. About a couple miles up the hill you will see a sign warning you that the scenic view is close, you can't miss the pull off. "Sunset at Lake Tahoe 16" - This orange and yellow sunset at Lake Tahoe was photographed from the vista point on Hwy 431, or Mount Rose Highway. Photos from the designated viewing area are great but I prefer the view from a little lower. If you're careful, you can climb down the rocks and get to an area with less trees blocking your view. Be careful if you do this, a fall would be bad. If you have a wide angle lens, you should be able to get a photo of the entire lake. But I tend to prefer to zoom in a bit on the Crystal Bay California / Nevada state line point. The photo below was shot with a Canon 5D MarkII and a 24-105 mm lens, set to 105. 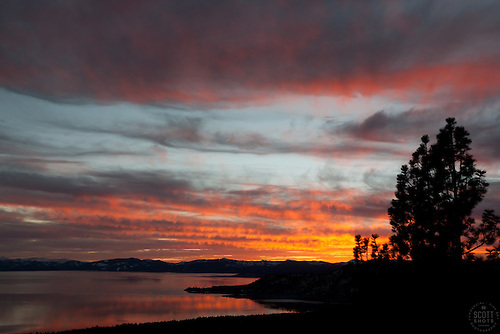 "Sunset at Lake Tahoe 18" - This orange and yellow sunset at Lake Tahoe was photographed from the vista point on Hwy 431, or Mount Rose Highway. All of the images above are available as large and small fine art prints, printed by Scott Thompson personally. Also available as gift items and to download and use as stock photography right now. Click on an image for more info. 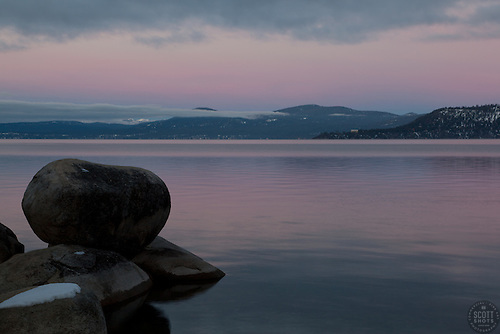 This morning I woke up at 3:45 am and drove to Memorial Point on the North East shore of Lake Tahoe. Memorial Point is a great place to photograph boulders. There is plenty of easy free parking and there are stairs and trails down to the lake from the parking lot. Getting to the lake in the dark to set up for a sunrise shot is not a problem as long as you have a flashlight. 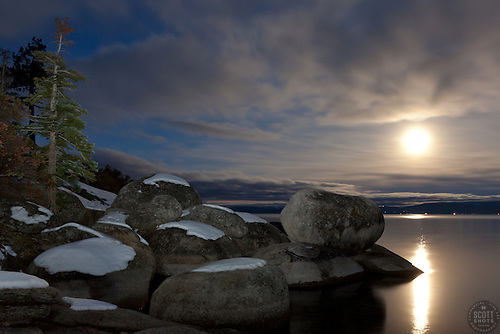 "Full Moon over Lake Tahoe 7" - These snow covered boulders and full moon were photographed in the early morning near Memorial Point, Lake Tahoe. "Tahoe Boulders at Sunrise 17"- These boulders were photographed at sunrise near Memorial Point, Lake Tahoe. The photos above are all available as large and small fine art prints, gift items, and to license and use as stock photography right now. Click on an image for more info.